RV Tour - Eat See RV! Meet Mo! 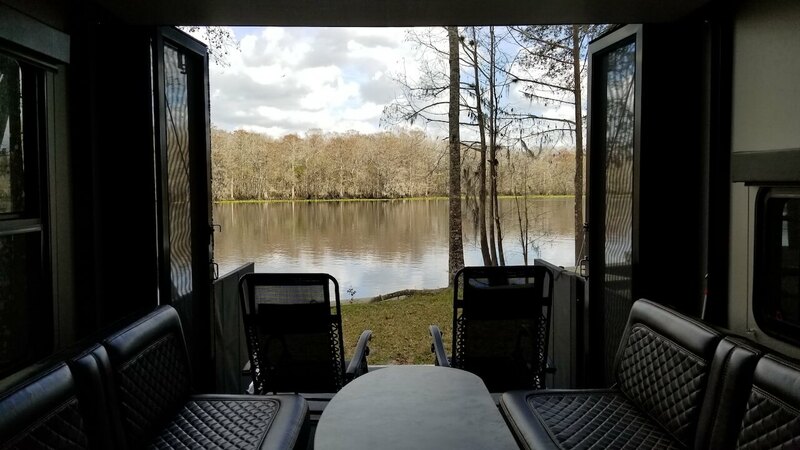 Our 35′ 11″ long fifth wheel toy hauler. She is a 2017 Grand Design Momentum 328M. 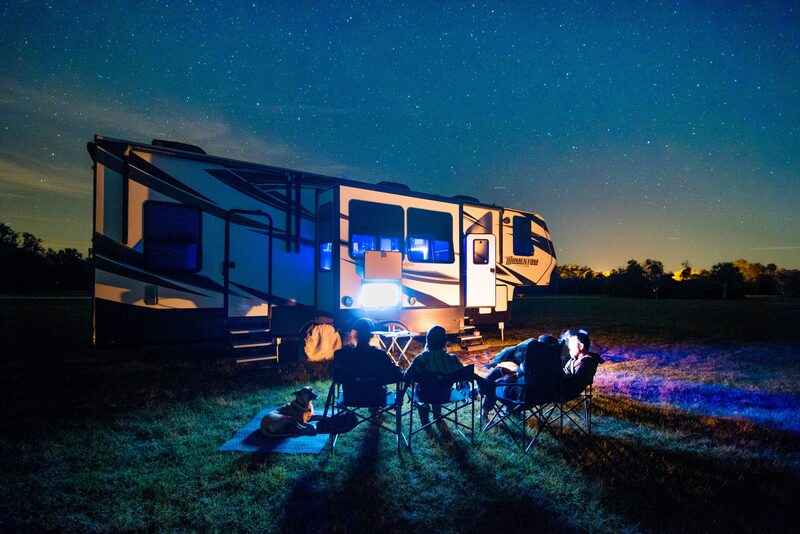 She is our self-sufficient pull behind mobile home and office that allows us the freedom and comfort to explore the United States and beyond. 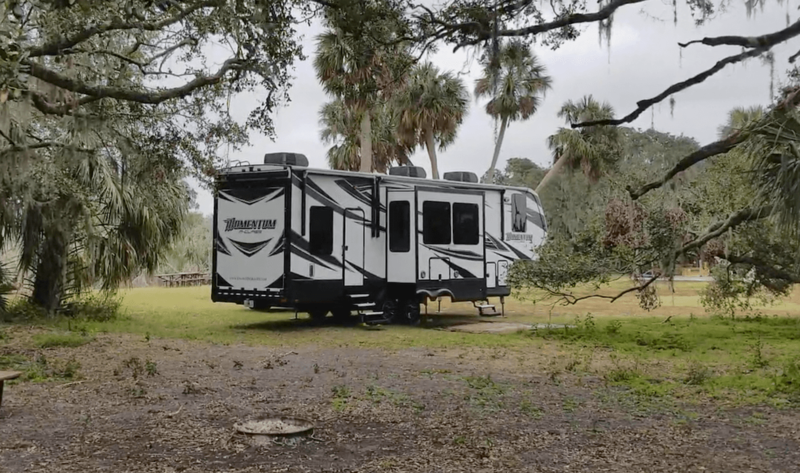 We were very diligent in our RV shopping and took a lot of time to research and tour the numerous layouts, class types, and rigs that are out there to find the right one for us. After about one year of hands on research, we decided on Mo. Brand spankin’ new, straight from the factory in Indiana. We know buying new (especially an RV which depreciates rapidly), isn’t typically suggested, but this is our home not just a recreational vehicle for weekend getaways. Mo offer’s all of the amenities we wanted, at the right size, and with the right decor. Take a look at our virtual tour below which gives you all the details on why we chose this rig in particular as well as what we love or don’t love about her. Hope you enjoy! 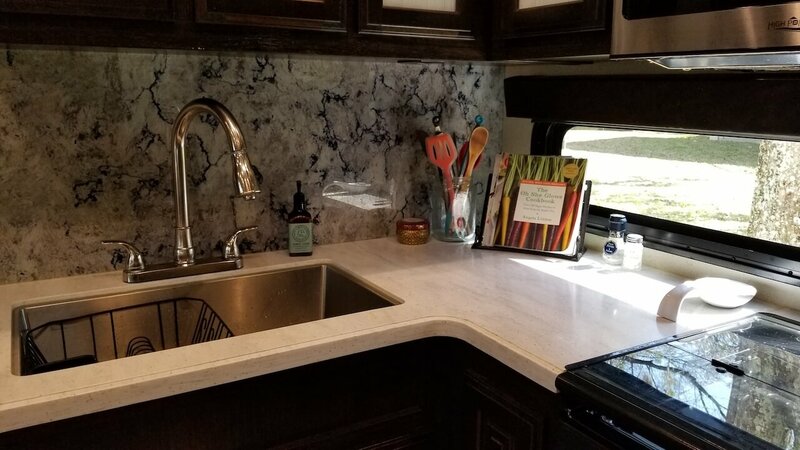 We purchased Mo in March of 2017 from the Florida RV Supershow in Tampa, FL. 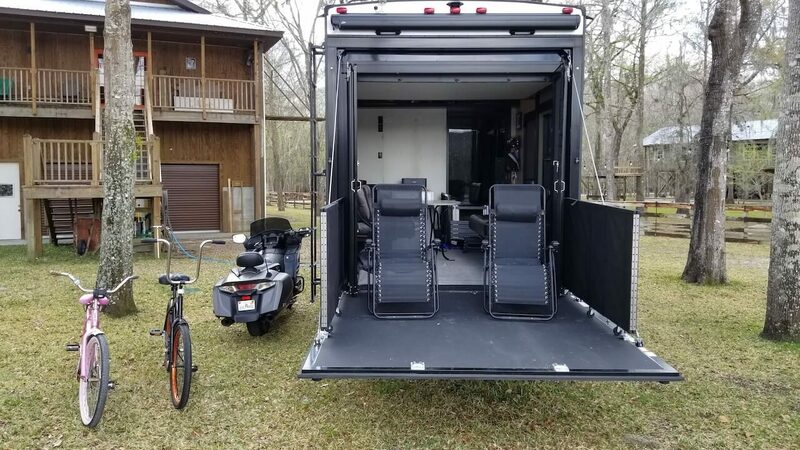 Grand Design was a newer company at the time (just started putting out rigs in 2015) and we had a hard time finding their models to tour at RV Dealerships. 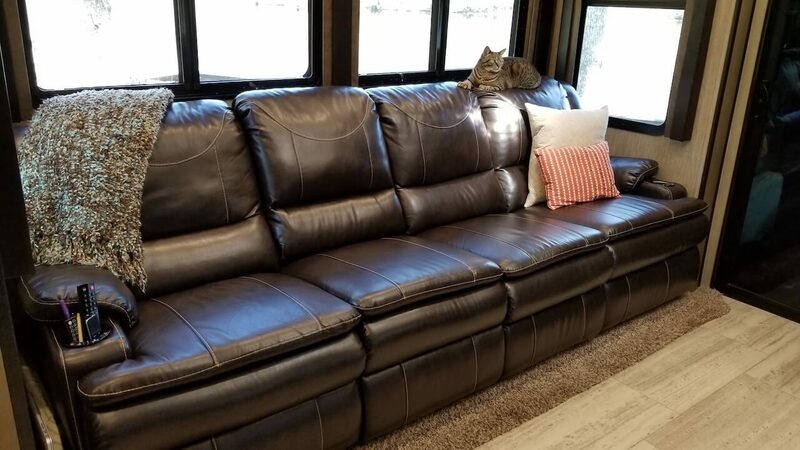 When we saw they would be at the Tampa RV show, we knew we had to go! We are glad we did because after one step inside we knew it was the one we wanted. 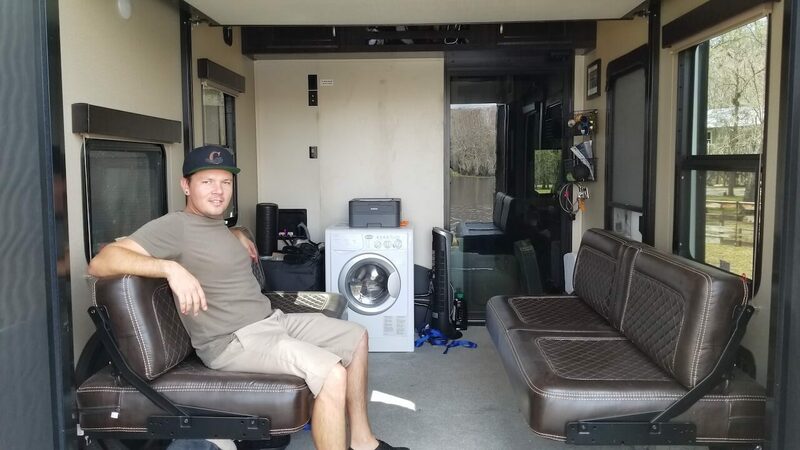 It was the right size (just under 36′) which allowed us to park in more national and state parks than a larger comparable rigs, had a separate living space from the garage (not all toy hauler do, especially under 36′), and was beautiful! While they tried to sell us on the floor model at the show, we wanted to include some upgraded features which had to be installed at factory. It took about 30 days to get our baby made and delivered and the rest is history! GVWR (Gross Vehicle Weight Rating): – this means how much we can have on board with things like propane, water, our belongings, food, etc. Large Fresh Water Capacity: At 157 gallons – we can boondock for days, even weeks without a worry in the world! Large Gray/Black Water Capacity: This allows us to actually have somewhere to put all that fresh water after we use it. Again, this just extends our boon docking abilities. In-House Generator: It’s a high powered and high quality generator that is surprisingly quiet and uses little gasoline. We really like having it tucked away and love being able to turn it on or off with one easy press of a button. Auto-leveling Jacks: Yes, yes, and yes! Having these makes our lives so easy! This was the main reason we went with a new Grand Design vs. a used one. The 2016 & 2015 models didn’t have auto level jacks. OneTouch Control App: Turning on our generator, turning the water pump on or off, or raising/lowering the leveling jacks from the truck all from a single touch on our phone makes us both lazy and appreciative. Being able to use the app is one of our favorite features! Step in Pantry: It’s enormous and allows us to keep all the food, appliances, and drinks we could ever want, or dream of! Garage: This is really why we chose a toy-hauler, for the garage. We love that it can hold our Honda Goldwing F6B, bicycles, washing machine comfortably and out of the sun and rain. It also doubles as a guest bedroom and dinette. We love it’s versatility and functionality. Overall Decor: We really like the way Grand Design designed their coaches. They are modern and well built. It’s not 100% perfect, but this was the best we found for move-in ready, no redecorating or re-designing needed. The countertops and backsplash are beautiful as well as the flooring and electric fire place! The dark wood overall is a bit much, but you can’t win them all! Furnace: This baby is a lifesaver. While blankets are a great way to stay warm, some nights you just need a little help and the furnace does just the job. I like that we can keep it on temperature control so it automatically turns on below a certain temp. It’s just like a home! OneTouch Control Panel: It’s funny this is on our “favorites” and “least favorites”. As you saw in the video, we like the ability to use the app from anywhere but we wish we could control both awnings (why only one Grand Design)? and we wish we had the option to use switches for lights rather than having to use the OneTouch control panel. All we would like are a little options here. Not being fully wired for solar/inverter: This is not just Grand Design, this is a flaw we saw across the board with RV’s. While some newer models (like 2019 and newer) are finally starting to incorporate this, we hadn’t found any rigs that were 100% ready for solar (not just a plug in portable panel like we have) and inverter. The height: We love how tall our ceilings are, and also the storage space it allows but we didn’t realize how much stress that would add to travel. We are tall and we are constantly worrying about if we’ll rip off something from our roof (don’t worry we have), if we’re going to hit that tree and poke holes in the roof (don’t worry, we’ve done that too). Even if we were just a few inches shorter (let’s say 13′ flat) that would make a huge difference and wouldn’t take away too much from the storage or space! The Awnings: Grand Design has since changed the layout for their awnings, but we wish we had one full awning over the bedroom and living room slide in addition to the garage awning. We don’t really get full protection this way and end up not using them very much. We also would like the option for tilting. Since their automatic they are level all the time (which is not ideal in rainy weather). Our awning ripped off after a random Florida rain storm just one week after we got her…oh newbie problems! As you can see – she’s beautiful! We loved the “luxurious” decor and modern feel. We also liked the technology upgrades that were incorporated.